Three years ago, I wrote about "Privacy and Control", discussing topics of privacy in a world driven by data-collection and how "our gadgets have or will be taking on qualities commonly associated with gods: omnipresence, omniscience, and omnipotence". 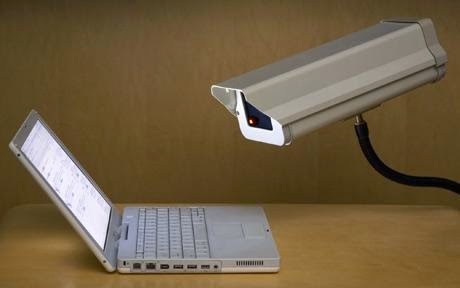 Today, I'd like to remember and reflect on those topics and check-in with how privacy is holding up under the current surveillance of our technology, most especially social media. Photo: GETTY IMAGES, found here. The maelstrom of data and information has grown in strength as technology develops. New venues for self-promotional social media pop-up everywhere; we have networks for where you go, what you're doing, what you're reading, what you're watching, who you're with, who might be nearby that you might want to meet, there are even services that enable you view and share the "as-it-happens" actions and location of your pets. For some, this is an exciting exploration of new territory. For others, it's a decent into terror. The relentless march of technology presents society with an unending series of thin red lines, boundaries beyond which the future of our familiar comforts are uncertain. We seem well aware that data is being gathered. Since publishing my initial article on this subject, there have been a number of controversies, revelations, and even revolutions having to do with privacy and data (e.g. PRISM, Vodafone report, RSA encryption backdoor). Have these events changed our view of technology and privacy? I think the events have certainly made more people aware of a long-existent situation. That awareness has sparked a new surge in privacy-positive actions and services, but I posit that the arms-race of information and privacy is nothing new. The previous surge, on the opposite side, was made in 2001 when the public feared terrorism more than surveillance (e.g. PATRIOT Act, TSA). Social media presents us all with a challenges to our current paradigms. Where do we draw our own personal lines? How much is too much information? Each of us must establish the boundaries of our individual comfort zones [INDY Blog: "Experience the Challenge"]. Much like the differing opinions on personal space within societies around the world, communities may find themselves interacting with individuals with differing social media "personal bubbles". While I often find myself comfortable with a very large social media bubble, you might be inclined to be more private. Today is the day that you define your boundaries and understand the lines which you are uncomfortable having others cross, whether governmental or social. Once you find those lines, stand up for them firmly. I respect your right to make your own choices. My choices might be different than yours, but I will still advocate for yours as long as they don't impede on the rights of others. Remember, remember the fifth of November.